ICanToo - 100% Cotton. MADE IN USA. Long Sleeve Tier Top for Women. This light-weight long sleeve tier top from ICanToo is perfect for everyday wear. The subtle tiers of fabric on the front add interest to a Top that is sure to be a favorite of yours. Casual, classy, and comfortable with your choice of three eyecatching colors, you'll be sure to add this top to your wardrobe! Very soft and made with 100% Cotton. Standard Women's Sizing in S, M, L, XL, & 2X. Falls to mid hip. 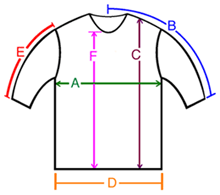 A: Chest / Bust circumference 36-37" 38-39" 41-42" 44-45" 47-48"
B: Sleeve length from center of neck to end of sleeve 29.5" 29.5" 31" 32.5" 33.5"
C: Body length from shoulder to bottom of hem 26.5" 26.5" 28" 28" 29.5"
D: Hem circumference 40" 42" 46" 49" 51"
E: Sleeve length from shoulder to end of sleeve 22" 22" 23" 24" 24.5"
F: From the bottom of the V-Neck to hem 21.5" 21.5" 22.5" 22.5" 24"